For every third party inspection you booked, you get an inspection report and you will see the inspection result of an inspector’s on-site examination, which gives you a snapshot of the status of shipment. “Pending” – Quality is within pre-determined AQLs, the product has passed any on-site tests required and it meets any other requirements or regulations, but there’s some issue the inspector wants to bring to the importer’s attention that was not included in reference documents or specifications, Inspectors may use different language in reporting results, such as “accept” instead of “pass”, or “hold” instead of “fail”. But generally, these are the characteristics which define these basic results. Most of the time, you can make a simple decision based on a result of pass or fail especially in some solidified and repeated inspections. But there are some exceptions when you might accept or reject an order, despite an inspection result that seems to indicate otherwise. Anyway the chance of this happening is typically quite small because you would’ve likely outlined such an obvious point to your QC provider in China. but you still need pay attention with the this as the factory management and workers have to rework or replace goods, despite having passed inspection. As an importer, you may decide to accept an order that’s failed inspection. Just as rejecting an order that’s passed inspection, this most often reflects inaccurate or incomplete criteria used for inspection. You might also accept an order that’s failed due to defects or nonconformities that you don’t consider serious, often reported as “minor” AQL defects. And you might accept an order that fails inspection if you urgently need to ship the goods. But you can almost always prevent this by arranging inspection well ahead of the expected ship date. Pending inspection results arise from some checking points no passed but accepted, or an inspector erring on the side of caution when they’ve found one or more potential issues that inspection criteria don’t clearly address. A factory representative may have refused to allow inspectors to conduct a particular on-site test. Or inspectors may have measured product dimensions and found them nonconforming in the absence of any tolerances. These are examples in which the quality inspector may require feedback from the importer before determining a clear pass or fail result. 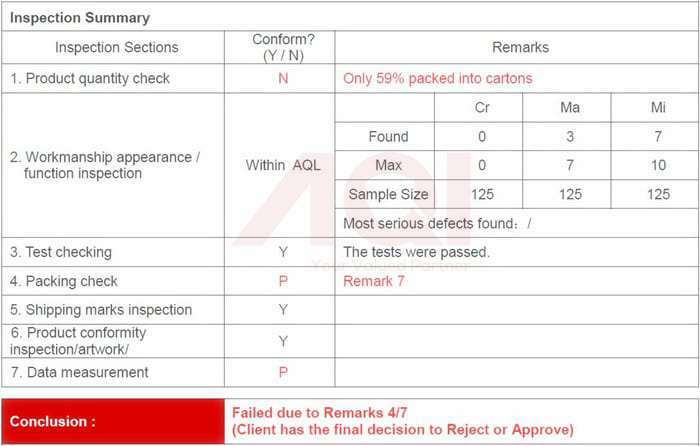 QC inspection results mean for shipment If you decide the issues in a pending report aren’t serious enough to reject the order, you might approve the order for shipping. Similarly, you may reject the order if the issues found in the report require re-inspection or action from the factory. Any time you have a pending inspection result, or your shipping decision runs contrary to the result, give feedback to your inspection team on how to consider these issues in future inspections so as to avoid a similar situation in the future. And if requirements change between arranging QC inspection and receiving the results, update your supplier and inspector immediately to prevent confusion.